Melbourne-based pianist, Hoang Pham was born in Vietnam and moved to Australia with his parents at an early age. He studied privately with Rita Reichman and at the AUSTRALIAN NATIONAL ACADEMY OF MUSIC, following childhood instruction from his father, a pianist and guitarist. He has, most recently, studied with Marc Silverman, at the MANHATTAN SCHOOL OF MUSIC, where he completed both a Bachelor Degree and Master of Music Degree. 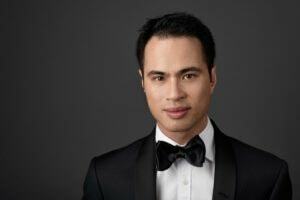 Hoang Pham is the winner of the 2013 SYMPHONY AUSTRALIA YOUNG PERFORMERS’ AWARD. He was the 2005 winner of the LEV VLASSENKO PIANO COMPETITION in Brisbane and at the SYDNEY INTERNATIONAL PIANO COMPETITION was awarded Best Australian Pianist in 2008. In 2010 he won the inaugural MELBOURNE RECITAL CENTRE GREAT ROMANTICS COMPETITION, his live performance of Chopin, Bach, Liszt and Paderewski being commercially released on the MELBOURNE RECITAL CENTRE’s MASTER PERFORMERS CD series. Reviewing this performance, THE AGE wrote, One of the solid success stories in recent Australian pianism, Hoang Pham, gave an exemplary recital… demonstrating an expected patina of finesse… Music-making of impressive insight…substantiate Pham’s growing reputation as a formidable executant. He has also been a prize winner of the BOSENDORFER PIANO COMPETITION, the CLEVELAND INTERNATIONAL PIANO COMPETITION and the HILTON HEAD INTERNATIONAL PIANO COMPETITION in South Carolina. He has also served as a jury member for PIANO/OHIO, the junior division of the CLEVELAND INTERNATIONAL PIANO COMPETITION and appeared in recital and conducted masterclasses at the 2011 NEW ZEALAND INTERNATIONAL PIANO COMPETITION in Auckland. In addition to his solo and concerto performances, Hoang Pham has performed both in Australia and internationally, as a member of the highly regarded, MELBOURNE PIANO TRIO and TRIO BRESCIANI. During 2012 he gave recitals for the UNIVERSITY OF MELBOURNE and for RECITALS AUSTRALIA in Adelaide of which the ADELAIDE ADVERTISER wrote, He is essentially a musician belonging to the great romantic pianistic traditions of the 19th century, with playing bearing all the hallmarks of rich cantabile treble and bass lines, elegant rubato, thunderous fortissimos and cleverly-delineated countermelodies extracted from the score seemingly at a whim… The 24 preludes of Chopin, spot on stylistically… Liszt’s Variations on Weinen, Klagen, Sorgen, Zagen suited him perfectly, their tensile strength and grandiose presence were all masterfully portrayed… True to the form Liszt himself exhibited. 2012 also included an appearance as concerto soloist with the MELBOURNE CHAMBER ORCHESTRA in the MELBOURNE RECITAL CENTRE. During 2013 he appeared as soloist with the MELBOURNE SYMPHONY ORCHESTRA at the SIDNEY MYER MUSIC BOWL and solo recitals at MELBA HALL at the UNIVERSITY OF MELBOURNE of which THE AGE said of his performance of Scriabin’s BLACK MASS SONATA, …showing a mastery that converted its seemingly aimless trajectory into a model of clarity., and of the Liszt APRES UNE LECTURE DE DANTE, …loaded with passion and panache. He also gave concerto performances with the NEW LONDON ORCHESTRA at the FOUNDLING HOSPITAL in London, was presented in a solo recital by the GEELONG MUSIC SOCIETY, appeared with violinist, Ji Won Kim, in the MELBOURNE SYMPHONY’s STRAVINSKY FESTIVAL and was engaged by MUSICA VIVA AUSTRALIA to appear in a series of concerts at the 2013 HUNTINGTON ESTATE FESTIVAL. Hoang Pham‘s engagements during 2014 included the AUSTRALIAN BALLET’s Sydney, Brisbane and Melbourne seasons of IMPERIAL SUITE in which he appeared as soloist in the Tchaikovsky PIANO CONCERTO NO.2 and a performance of the solo piano version of PICTURES AT AN EXHIBITION as part of the program of the TASMANIAN SYMPHONY ORCHESTRA. Of peformances of Gershwin’s RHAPSODY IN BLUE with the WILLOUGHBY SYMPHONY ORCHESTRA the SYDNEY ARTS GUIDE wrote, …full of dazzling virtuosity, crystal clarity and fiery intensity., while THE CULTURE CONCEPT said, …gratifying on every level … flawless finesse and an impeccable style. Other engagements during 2015 included the Liszt piano concerto with the MELBOURNE SYMPHONY ORCHESTRA and 2016 included Tchaikovsky’s PIANO CONCERTO NO.1 with the ZELMAN MEMORIAL SYMPHONY ORCHESTRA in Melbourne. During 2017 Hoang Pham appeared as soloist in the Chopin PIANO CONCERTO NO.1 in the program of the BALLARAT ORGANS OF THE GOLDFIELDS FESTIVAL and the Rachmaninov PIANO CONCERTO NO.2 with the HEIDELBERG SYMPHONY ORCHESTRA, presented two performances with his piano trio for the PENINSULA MUSIC FESTIVAL and gave solo recitals for MONASH UNIVERSITY, and at the MELBOURNE RECITAL CENTRE and at CITY RECITAL HALL in Sydney, also in the inaugural program of the MELBOURNE WAREHOUSE MUSIC FESTIVAL and at BRIMBANK CITY COUNCIL‘s new performing arts centre, THE BOWERY. He also gave performances of the two-piano version of Rachmaninov’s PIANO CONCERTO NO.3, with David Helfgott, in Istanbul and Ankara. 2018 includes a return to the HEIDELBERG SYMPHONY ORCHESTRA, performances of Rachmaninov’s RHAPSODY ON A THEME OF PAGANINI with the GEELONG SYMPHONY ORCHESTRA and recitals in the ARDEN CRESCENT SERIES in Melbourne, for the GEELONG FRIENDS OF THE MSO and a guest solo appearance in QUEENSLAND PERFORMING ARTS CENTRE‘s SONGS OF HOPE & HEALING charity concert in Brisbane. He also returns to Istanbul for the Rachmaninov PIANO CONCERTO NO.3 with David Helfgott.